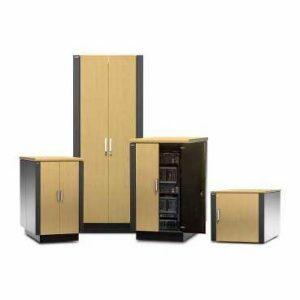 IT and Data Center Cabinets are more important that you think in reducing costs and increasing efficiency. Choosing the right racks for your IT needs is essential. Improper enclosure sizing along with poor cable management causes congestion and restricts airflow which leads to overheating and can affect the life of your equipment. With the right enclosures and cable management you can eliminate congestion, allow proper airflow, and keep your cables in order and avoid unplugging the wrong one. Space for cable routing is one of the largest problems customers encounter when installing their equipment. 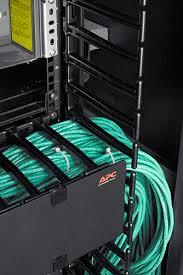 APC offers various cable management products to facilitate cable management in the front and rear of the enclosures. These products are designed for a variety of applications. 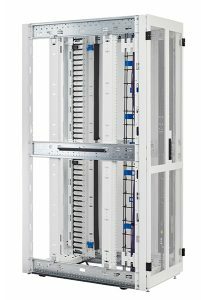 Designed to organize, protect and manage critical IT applications, the Eaton RS Enclosure for Servers Enclosure configuration features customizable and tool-less mounting options to accommodate power equipment, including UPSs and ePDUs, for environments ranging from small IT closets to MTDCs.